Presenting a pristine exhibit of the Pra Roop Muean Pong Prai Kumarn Ta Bronze Wanich Nuea Pong Prai Kumarn Hlang Yant Ha (Yant Ongk Pra on rear face) first edition amulet of extreme rarity, of Luang Phu Tim. Only 96 of these amulets were made in first edition 2518 BE release. This exhibit is an especially attractive example, with Bronze Wanich coating, and highly refined features. This amulet is in excellent pristine condition, and highly eligible for entry in competition. The front face features the image of Luang Phu in meditative contemplation. The fluffy Pong Prai Kumarn powders are revealed through the surface of the golden Bronze Wanich. The rear face features the Sacrted Yant Ha of Luang Phu Tim, and is also covered with Luang Phu Tim’s inimitable Bronze Wanich. This is the all-time classic Original Wat Laharn Rai first edition 2518 BE Release of the Pim Jantr Loi, which saw only 96 amulets made in various block presses. This particular exhibit has pristine features and is ‘Ongk Kroo Doo Ngaay‘ (easily identifiable for its classic appearance, with no visual discrepancies, and the evident presence of authentic Pong Prai Kumarn Luang Phu Tim). The Muan Sarn Sacred Powders of the Roop Muean Jantr Loi Pong Prai Kumarn Luang Phu Tim, are one and the same as the powders found in the extremely expensive Pra Khun Phaen Pong Prai Kumarn amulets of this Master. For this reason, are considered a perfect alternative (and more affordable,) to the Pra Khun Phaen Pong Prai Kumarn Luang Phu Tim. 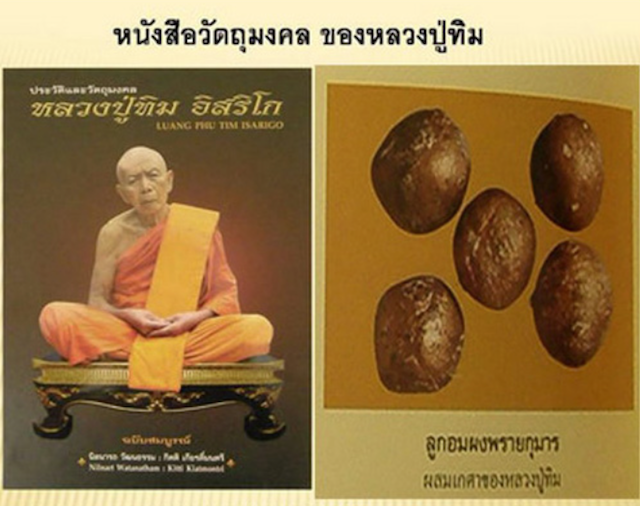 The famous Pong Prai Kumarn powders of Luang Phu Tim are considered by most people to be the most powerful Muan Sarn powders of All Time for Maha Lap Maha Pokasap and Maha Sanaeh Metta Maha Niyom power. The Original amulets of Luang Phu Tim which were released at Wat Laharn Rai, are known to differentiate themselves from other editions released by Luang Phu Tim at other temples. This is for his use of Bronze Wanich golden paint, to cover only amulets in the editions he released through his own temple. Other temple releases of his amulets are of course equally authentic and Sacred, but less preferred than the ones which came through direct release at the temple of Wat Laharn Rai. 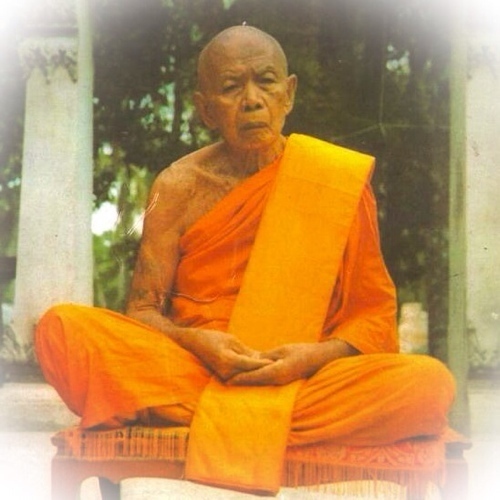 Half the reason being, that Luang Phu would use a much more highly concentrated mixture of Pong Prai Kumarn in the editions he released at his own temple at Wat Laharn Rai. Whereas the related temples where he allowed release and assisted in the blessings, would also mix other Muan Sarn Sacred Powders into the mixture, which despite also being extremely sacred and powerful, would then allow for less quantity of Luang Phu’s highly prized and revered powerful Pong Prai Kumarn powders to be added. It is hence considered that the Wat Laharn Rai release versions are believed to be much more powerful Maha Lap and Maha Sanaeh type Magic, which are two of the preferred powers with those who like to use Seduction for Love and Business, and Gambling, Lottery and Wealth Attraction. In addition, Luang Phu Tim’s amulets are world famous for Kong Grapan Chadtri Klaew Klaad Protection. The second reason for the Wat Laharn Rai releases being the most highly revered and preferred above other editions which Luang Phu blessed and released at other temples, is more of a speculative one. By this, we mean that the Wat Laharn Rai release editions tend to win over other editions in competition. They are also considered to have more aesthetic beauty to them for their high presence of Pong Prai Kumarn and the special high quality ‘Bronze Wanich’ golden coating. It is a part of the amulet appreciation society expert’s method of authentication to examine and study the appearance of how bronze Wanich golden paint develops in surface texture, tonality and porosity of the surface, as well as the appearance of Luang Phu Tim’s famous Pong Prai Kumarn which rises up and through the surface of the fine golden painted surface. We ourselves feel that all of Luang Phu Tim’s amulets are equally Sacred and Powerful in their own way, regardless of which edition or which temple he blessed them at, but we do, as do all Amulet Appreciation Fanatics, recognise the categories of preference within the heirarchies of different editions, which is for us one of the more subtle and fascinating parts of the study of high end amulets within the collector scene, and part of the fine art of learning how to recognise and value Sacred Amulets of High Preference and Rarity. The amulets of Luang Phu Tim, are amongst the most popular amulets in the whole Pantheon of Thai Buddhist Amulets of the last century, and of all time, and is now almost impossible to encounter commonly anywhere except the high end emporiums, and around the necks of the rich and famous. The Pim Jantr Loi is a very rare amulet of Luang Phu Tim, which was only made in extreme limited number of 96 amulets of this 2518 BE fist edition block press, and is a seriously sought after acquisition for the serious collector of Luang Phu Tim’s Pantheon of Amulets. The powerful Pong Prai Kumarn powders are undoubted for their immense Maha Sanaeh Maha Lap power, which has made the amulets of Luang Phu Tim so highly regarded not just for their Master-Class Status, but for their Magical Power to Invoke Prosperity and Invincibility, Luck and Mercy Charm. The Sacredness is equal to the somewhat more expensive Pra Khun Phaen Pong Prai Kumarn, the Muan Sarn Sacred Powders are the same, and in addition, the Bronze Wanich, is also the very same which Luang Phu used to paint the Pra Khun Phaen Amulets of his pantheon, and is one of the recognition factors used to identify his amulets.. This of course makes this amulet a perfect acquisition as both a Master-Class Exhibit and Powerful Amulet of World Fame, but also to use as ‘Ongk Kroo’ (teacher) amulet to obtain an authentic study material, to train the eyes as to the appearance of the Muan Sarn and Surface textures of Luang Phu Tim’s amulets. With time and patience viewing the Muan Sarn Sacred Powders under the eye loupe, you will be able to train yourself in recognising the authentic amulet when coming across one in future. Notice the full fluffy texture of the surface, and the greeny-white marbled Pong Prai Kumarn powder rising up top the surface. This is one of the most difficult effects for forgers to reproduce, and assists you in authenticating his amulets, to know the difference. Hence, the amulet is also a perfect ‘Ongk Kroo’ reference study material for students of the Pantheon, and will increase your chances of spotting an essential rarity at the right price, and without danger of risking a fakery. We highly recommend this amulet, as a sound investment and a last chance to obtain and be the proud owner of an authentic 1st Edition Wat Laharn Rai release model of the Eternal Classic Roop Muean Pong Jantr Loi Pong Prai Kumarn of Luang Phu Tim. Luang Phu used the Bronze Wanich used in this amulet, to paint the famous Nang Paya Plai Diaw, Nang Paya Plai Koo, Look Om Pong Prai Kumarn, and the Classic Pra Khun Phaen Pong Prai Kumarn Amulets for which he became so famous. A perfect study piece, and an incredibly Sacred Amulet for Bucha to receive guaranteed Magical Power. A highly attractive and rare Sacred Amulet, that is truly Powerful and stands as the Master Class Amulet of its Category, and is considered a Most Highly Prized addition to any Master Class Collector’s Showcase, and more importantly, is a most powerful amulet to possess for Bucha, and receive its Blessings. History has proved the amulets of Luang Phu Tim time and time again to be one of the most powerful and famous amulets in Thai Amulet History. The making of the Muan Sarn Pong Prai Kumarn Luang Phu Tim, came from the Wicha which Luang Phu had inherited through apprenticeship form one of his high Kroo Ba Ajarn, Kroo Ba Sangkh Tao, who was also his true Uncle. Part of the formula included Pong Prai Maha Phuudt, which was made from the Skull of a male Kumarn who died in the Womb, and who died on a Saturday and was cremated on a Tuesday. This is part of the ancient Khmer Necromantic Formula for Authentic Powerful Prai Occult Magic, as practiced in Ancient Times. Due to the fact that Monks are not allowed to seek and find this Sacred and Extremely Powerful Necromantic Substance, Luang Phu would perform Korb Kroo Initiation for protection against Black Magic and the Phuudtaa Spirit Phantoms, so they could go forth to seek and find the substances to donate to him for the making of the Pong Prai Kumarn. The Initiated Lay Devotees and Apprentices to his sorcery, would then wait for the news of the right circumstances of death of Kumarn Ghosts, and go out to collect the substances and prepare them as instructed with the Wicha. They would seek the permission of the relatives of the dead, to obtain the substances to enable the ghosts of the deceased to receive merits to free them from their Karmic residues by donation of their mortal remains to be made into amulets. They would receive the ceremonial ritual liberation of their souls from Luang Phu Tim, who would speak with the spirits of the dead to receive their acknowledgement for the process of transformation through the Nibbana Sutra, and the Muan Sarn would then be prepared according to the Dtamra Saiyasart of Necromancy, to make the Pong Prai Kumarn. Luang Phu instructed his apprentices and the relatives of the Funerals to take care not to incinerate the whole skeleton, but to keep the skulls to bring to Luang Phu to use them for the making of the Pong Prai Kumarn. This is one of the reasons why his Pong Prai Kumarn is so powerful, because it does not contain the skeleton bone powders, rather, only those of the skulls. As a result, Luang Phu Tim’s Pong Prai Kumarn has been recorded by experience of devotees to posses the highest Maha Pokasap Power of all Pong Prai Kumarn ever made, with Immense Metta Maha Niyom and Klaew Klaad Power, to induce Mercy Charm, Attract Lucky Fortunes (e.g. Lottery Winnings), and to Protect from Deadly Accidents and Disasters.The power of the Pra Roop Muean Jantr Loi amulet is said to be just the same as the Pra Khun Phaen, with the only difference being the design. Luang Phu Tim Isarago, is of course not only one of the most highly acclaimed and sought after Guru Monks for his amulets, he is the holder of the highest esteem in Thai Buddhist amulet history for Pong Prai Kumarn powders. Luang Phu Tim, is Internationally Acclaimed, for his famous Pra Khun Phaen Pong Prai Kumarn, Pra Kring, Rian (coins) and Look Om powder balls. As to the classic ‘Rian coin image amulets, many have become all time favourites, and eternally, world famous classic amulets of the high end variety. 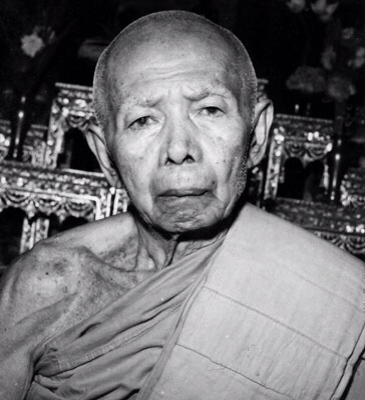 Since his passing, his devotees and apprenticed monks, have now become the world’s top living masters for the making of Pra Khun Phaen Pong Pra Kumarn, and literally dozens of encyclopaedic books, have been printed, documenting both this great master monk, and his classic amulets of high esteem. Buddhist monk coins with his image and others with Buddha images and other deities and imagery are amongst the most highly collected amulets and most expensive of all of the great Luang Phu Tim. He has various direct lineage apprentices, Who are continuing to progress and spread his most powerful and world-famous Wicha. Of all of these masters, perhaps the most famous, preferred, was Luang Por Sakorn, of Wat Nong Grub, who is also now deceased, and whose amulets are fast becoming just as highly sought after. 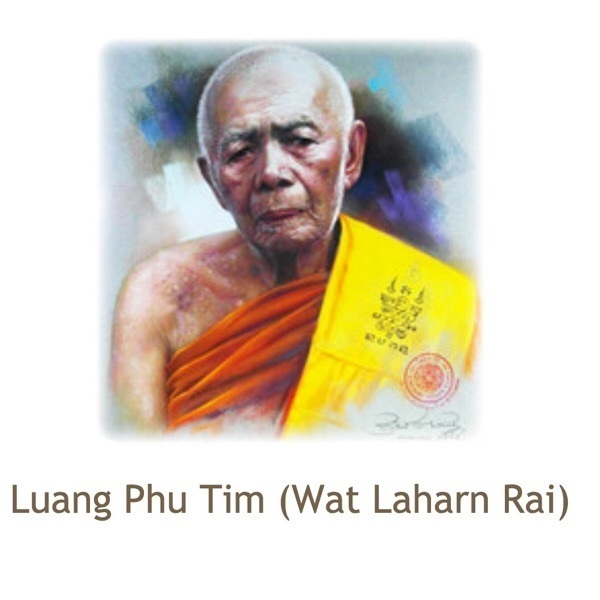 In second place one could possibly estimate the great Luang Phu Sin, of Wat Laharn Yai, and in third place, possibly, Pra Ajarn Somkid, of Wat Beung Tata (Rayong).